This is seriously frustrating issue. 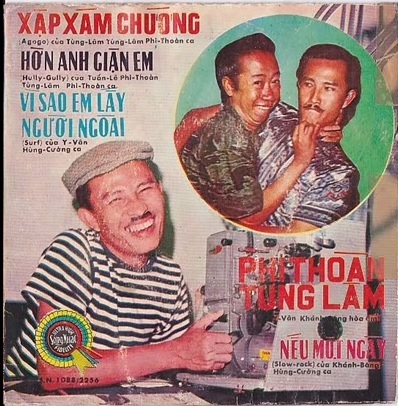 One of the viet vinyls I enjoy most, and the labels are totally trashed so I have no idea who the artists are! Four tracks of easy-for-western-ears vintage popular music. A-side is comedy music (at least I hear it so refering to the singing style and the spoken intro), B-side is more serious crooner-style pop. Especially on side A (and some old thai records I've heard) there is something that reminds me of old Jamaican ska records... maybe it is the sound of the horn section.